This brazen beauty is a souvenir from Spain. Or was it Portugal? Or Andorra? I’m not sure about that anymore. However, it is handmade and a beautiful decoration for our backyard :). 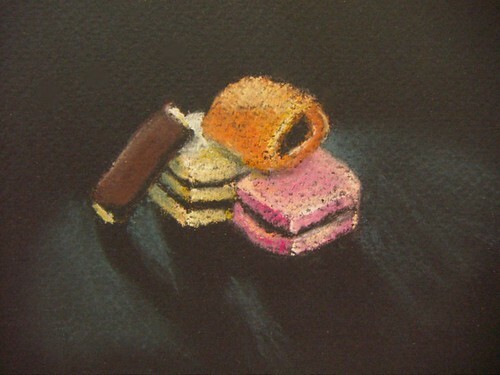 Some months ago I sold my set of pastels on eBay. I was tired of them, they were just so …dusty and ….messy and …damageable. (And we have these white carpets, you know…) Furthermore the finished paintings are so difficult to store and they always have to be framed. To cut it short, I have been very happy that I finally got rid of them. Yesterday however I was visiting my local art supply store and came across this very, very cheap set of pastels. As I said they were cheap and I loved their touch and their grip on the paper… so I bought them. Why do we always make the same mistakes again?! Maybe I’m addicted to art material. EDM 96 – Draw something sweet: licorice. I think there are just two kinds of people. Those who love licorice and those who hate it. I hate it . Nevertheless I think it’s looking pretty enough to be drawn :). These are my two mag lite flashlights. Drawn next to each other for size comparison. The small flashlight can be attached to a key-holder. The large one is really heavy and I do not use it often. I keep it next to my bed just in case I could need it at night. It’s annoying that one has to change all those batteries every three years. 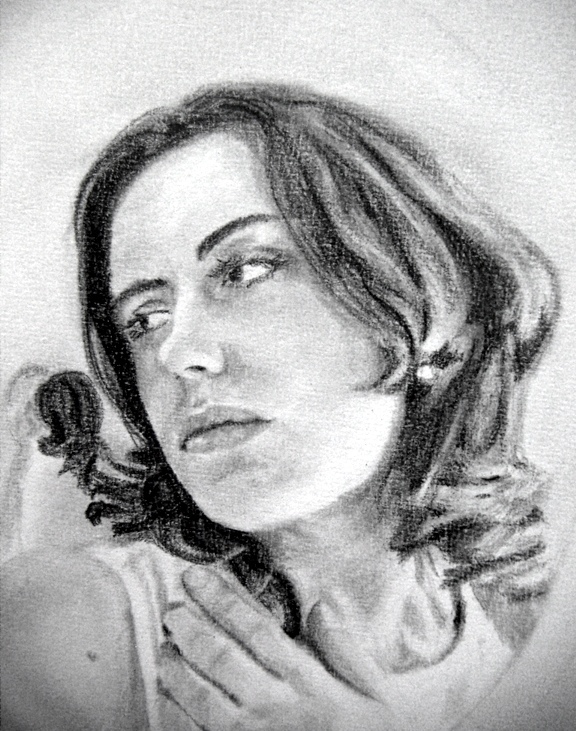 And another sketch. Obviously something round ;-). Depicted is a globe I bought many years ago. Ever since then it has been standing on a bookshelf next to my desk. There’s a light bulb inside which turns it into an interesting kind of lamp by night. I imagined it to be easier to create the effect of seas and continents wet-in-wet. In fact it wasn’t. The colors just spreaded the way they wanted this time. One never stops learning. loose style… wet in wet… it’s so therapeutic to watch the colors spreading and fading randomly over the sheet of paper. 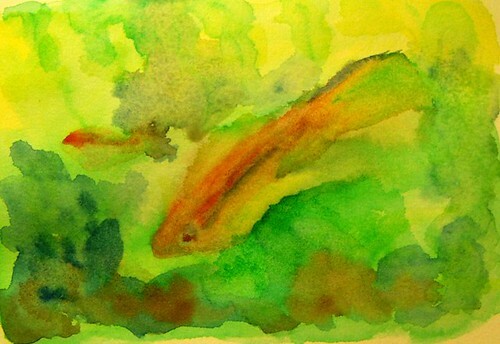 Oh, just in case it got too loose and abstract: it’s some fish in an aquarium :). An aquarium is a green world of its own and a wonderful subject for a wet-in-wet painting. The fish themselves are of all kind of colors, but each of them also reflects their green-yellowish surroundings. It’s a pitty the colors didn’t come out as bright as in real life. You are currently browsing the EDM category at : silviasblog.com :.